Mrs. Quilt Dad accidentally put her hand through a pane on our front window. She didn't have a scratch (luckily! ), but it had to be replaced. Our hot water heater blew, and that too had to be replaced. Last Tuesday, I had to leave work early to pick up the kids and take them to swim lessons. Of course, I was running late, and when I got out to the car the battery was dead. I finally got a jump, got the kids, got them to swim lessons, stood an hour in the pouring rain, got them back in the van ... and it was dead again. Had to jump it again -- in the pouring rain, mind you -- and immediately get it replaced. On the way home from swim lessons on Thursday, twin #1 was complaining of a tummy ache and proceeded to get sick all over the back seat of my car. We finally got out of the house last night (Friday) for some adults-only time to celebrate my wife's birthday -- yummy dinner with friends and a showing of "The Hangover" -- until the babysitter called to let us know that the stomach bug had moved on to twin #2. Which brings us to today. What's that saying, "if it wasn't for bad luck ..." ??? Ugh, sorry for the downer. Let's just hope things turn around for me in time for Father's Day tomorrow! Since it's been so long. I've got a few things backed up in the queue to share here on my blog. 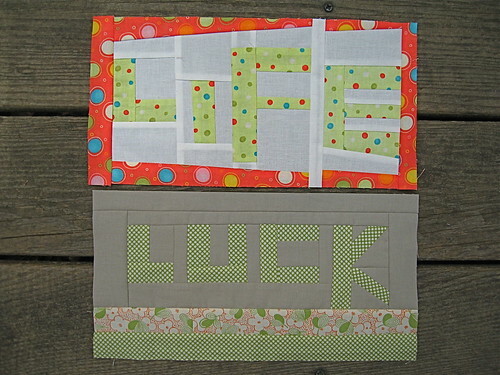 The first are some free-pieced word blocks that I made a few weeks back. 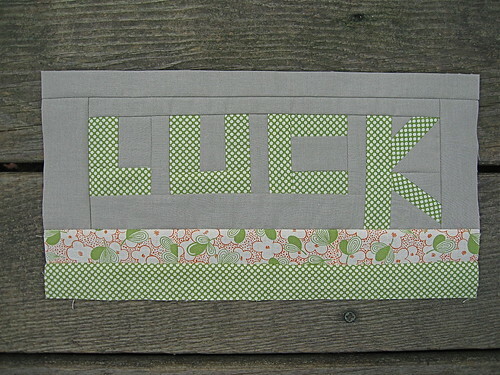 I've also wrapped up a couple of quilting bee blocks that I'll get posted shortly. Have you ever checked out Tonya's blog over at Lazy Gal Quilting? I knew that she's known all over blog-land as the queen of free-piecing letters (among other things), but I hadn't really had the opportunity to give the whole free-piecing thing a whirl. 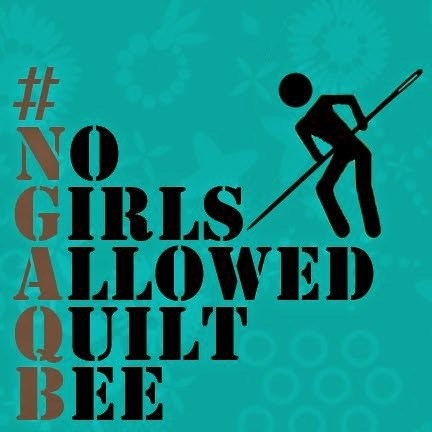 I was checking out Dionne's blog over at Sew Many Quilts and she mentioned that Tonya put a call out for quilt blocks for an upcoming project. 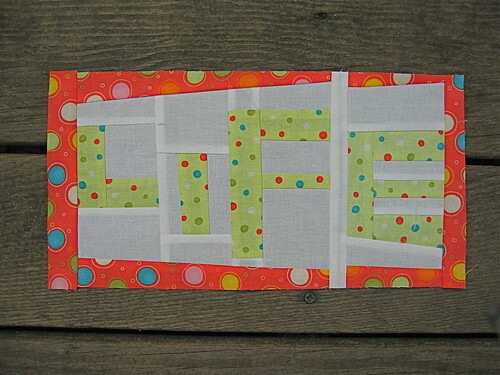 The project is called "Hope is a 4-letter Word", and Tonya was looking for 6.5" x 12.5" blocks featuring a "happy, positive, wonderful four-letter word" in bright and happy colors. I thought this sounded like such a fun little project and the perfect opportunity to practice free-pieced letters. 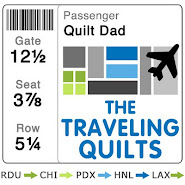 In true Quilt Dad fashion, I couldn't stop at just one! 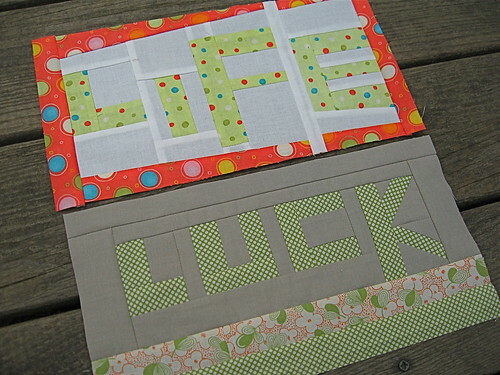 Making these blocks was a really enjoyable experience, and I can't wait to see how Tonya's quilt turns out!